Welcome to the newly completed oceanfront estate located at 6161 North Ocean Boulevard, Ocean Ridge, Florida. The highest quality craftsmanship and finest finishes are reflected in this custom home built and designed by the award-winning team of Mark Timothy, Affiniti Architects and Marc-Michaels Interior Design. 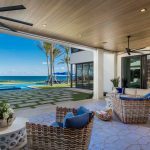 Offered furnished, this entertainer’s dream home features open concept spaces that seamlessly merge to showcase the sophisticated and refined interiors of the indoor-outdoor living residence. 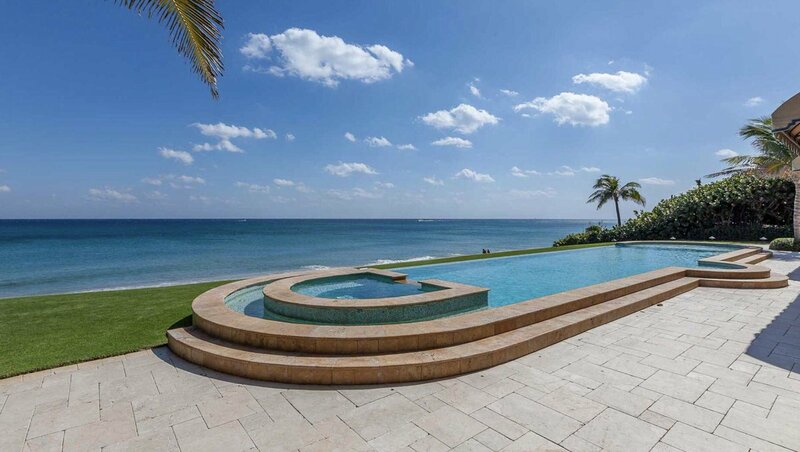 Situated in the Ocean Ridge Estate Section with 158 feet of direct oceanfrontage, the property enjoys a soaring elevation allowing for total privacy and unobstructed views of the Atlantic Ocean. 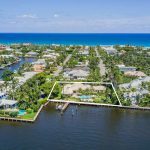 The Town of Ocean Ridge is perfectly nestled along South Florida’s Gold Coast and is conveniently a scenic drive along A1A from the thriving restaurants and boutiques of both Delray Beach and Palm Beach. Travelers will appreciate the three international airports and numerous private airports easily accessible via Interstate 95 or Federal Highway. 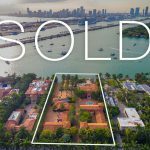 With a prestigious North Ocean Boulevard address, the clean lines of the front wall and pristine landscape combine to create sensational curb appeal. The property is accessed through a gated entry to unveil the stately two story home and manicured grounds. The decorative and expansive drive leads to the front of the home and then to the two separate north and south garages with a large overflow parking just off the main gate entrance. The residence has a unique entry walkway with two ponds on either side and the first glimpse of the grandeur that await through the glass double front doors. With vanishing pocket sliders throughout, the interior and exterior living spaces merge amidst the views of the resort-style pool, five-star grounds and endless ocean vistas. The formal living room is designed to perfection with quality finishes, linear fireplace and a décor that captures the seaside elegance. The formal dining room overlooks a charming courtyard and the chic office with floor-to-ceiling glass walls. The chef’s kitchen offers every culinary convenience with prep kitchen, butler’s pantry, top-of-the-line appliances, snack bar, spacious breakfast area, powder room and sliding glass doors that open to the family room. Enjoy the picturesque views of the ocean thanks to the vanishing pocket sliders that allow the family room to flow to the poolside terrace. The club room was designed for entertaining and enjoyment with a built-in bar and wine cellar at one end and two walls of sliders that open to the covered loggia and seaside grounds on the east end of the room. The first floor en suite guest bedroom with walk-in closet and laundry room with full-size washer and dryer are both located off the northern hallway which leads to the north two-car garage. The white oak floating staircase with glass railings, wood-paneled elevator and powder room are located off the southern hallway which leads to the south two-car garage. Showcasing stunning views of the ocean and grounds, the second floor grand master wing is a luxurious retreat with a tranquil sitting area; morning bar; access to the seaside balcony; and custom boutique his-and-her closets and baths each with walk-in glass showers and a separate soaking tub in her bath that overlooks the ocean. There are three additional en suite guest bedrooms on the second floor each with walk-in closets and custom, designer bathrooms. The spacious covered seaside balcony has automated screens and can be accessed by the master wing and two of the guest suites. The second floor also has a west-side open balcony that overlooks the grounds; laundry room with full-size washer and dryer; and large storage closet. With manicured grounds and abundant green spaces, outdoor living is a breeze. The covered loggia provides ample room for lounging seaside amidst the endless views and can be accessed from the first floor main living areas via sliders that invite the outdoors in. Enjoy endless hours of relaxing and entertaining around the resort-style heated pool with spa complete with seaside terrace, summer kitchen and cabana bath. Boasting 13,542 total square feet, this five bedroom residence is complete with all the modern amenities essential for luxury living. Features include white oak wood and limestone tile flooring; designer wall-coverings; impact glass windows and doors; generator; two separate garages with storage; security system; Smart house technology; top-of-the-line appliances; designer plumbing fixtures and more. 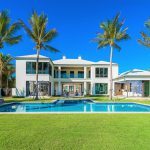 This brand new oceanfront estate located at 6161 North Ocean Boulevard, in Ocean Ridge is truly a work of art beautifully displayed amidst the endless ocean views. Offered furnished, this sophisticated residence invites luxury living that is second to none.